This scholarship is set up for middle school and high school age students in the school districts of Black River Falls, Alma Center, Melrose-Mindoro, and Blair-Taylor. Students in other schools may apply based upon special consideration such as, the applicant is a member of, or their immediate family is a member of, the Black River Area Community Band. The purpose of this scholarship is to enhance the level of expertise in the local school music programs. The $200 scholarship will monetarily assist a deserving student in grades 7-11 in attending a band camp of the applicant's choice. Evan Gawron was awarded a $200 scholarship in 2010. Evan has been selected to participate in the State Honors Orchestra. This includes a summer camp and performance at the Wisconsin State Music Conference in the fall. 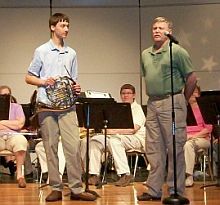 Evan has been playing French horn with the Community Band for the past two years. 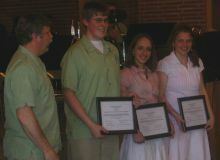 The first scholarships were awarded at the Band’s spring concert on May 4, 2008. Three $200 scholarships were presented by Band president, Randy Bjerke. The recipients are Cole Hanson, Lincoln High School in Alma Center, Heather Erickson and Marisa Johnson, both of Melrose-Mindoro High School. Information and applications will be posted toward the end of each school year.